There’s a lot more to Chinese tea than some leaves brewed in hot water. Sometimes, you’ll be in the mood for tea and not coffee. Whether it’s a part of your morning routine to have some first thing, or you only have it when you’re out at a Chinese restaurant with friends and family, there’s a lot more to Chinese tea than some leaves brewed in hot water. 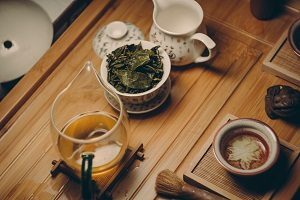 If you don’t know much about Chinese tea, then now is the perfect time to learn more about it. Tea is such a big deal in China that it’s almost impossible to distill a short version of what tea means to the Chinese people. Over the generations of thousands of years, the tea has been grown and refined to taste wildly different than the tea enjoyed in other parts of the world. Supposedly the Emperor Shennong decreed that all drinking water be boiled before consumption. This order was meant for safety reasons, but it soon grew to be more than that. The Emperor and his court followers were visiting a distant part of the land, far from the imperial capital. Servants prepared water for their refreshment, but leaves fell into the water and left behind a strange brown liquid. The emperor was fond of science and took it upon himself to drink some – leading to the discovery of tea. That’s why tea is believed to have originated in 2737 BCE. Just as there is a proper way to enjoy iced tea here in the United States, there are proper ways to enjoy tea when you’re in China, Hong Kong, or Taiwan. Tea is supposed to help satisfy your thirst. How good the tea is is determined by several factors: what color it is, how fragrant it is, what flavor it gives the water, and how clean the water is. There should be plenty of flavor in the tea for you to enjoy. Also, take some time to relax and think about your surroundings every time you lift your cup or set it down again – listen to the music that is playing, think about how you steep the tea, how you hold the cup, what food you eat while sipping your tea, and what you’re saying in conversation with your companions. This entry was posted on Friday, November 16th, 2018 at 1:01 pm . You can follow any responses to this entry through the RSS 2.0 feed. Both comments and pings are currently closed.